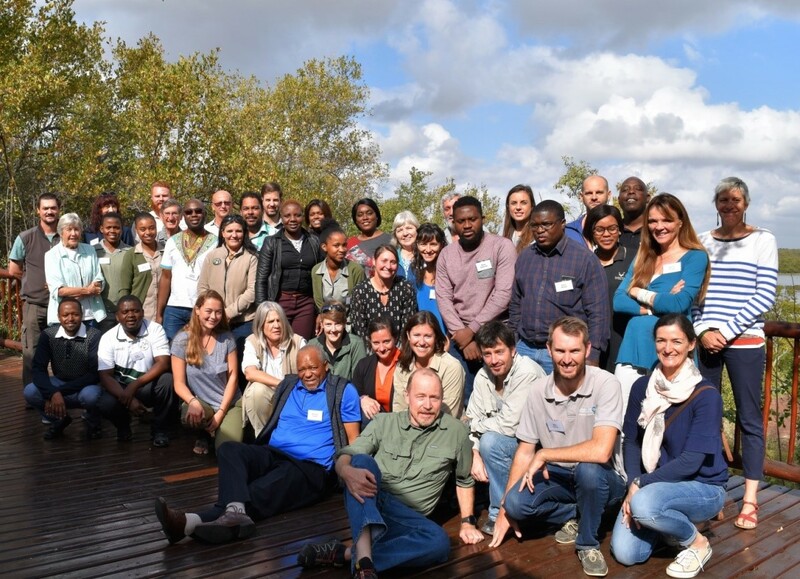 The 2018 Insaka Research Symposium was hosted by South African National Parks (SANParks) at Mopane Camp in Kruger National Park. It was a four-day event (11–14 June 2018) focusing on the theme ‘sustaining the ecosystem service benefits from green and ecological infrastructure’. The Kruger National Park provided an appropriate background to the theme of the symposium as it is one of the largest protected areas in Africa and forms part of the ‘Kruger to Canyons Biosphere’, designated by the United Nations Educational, Scientific and Cultural Organisation (UNESCO) as an ‘International Man and Biosphere Reserve’. Biosphere reserves are ‘science for sustainability support sites’, for testing interdisciplinary approaches to understanding and managing changes and interactions between social and ecological systems, including conflict prevention and management of biodiversity. In coupled social-ecological systems there are bound to be diverse groups of actors. As such there’s a need to understand how each group of actors uses and shares information about a given ecological infrastructure. This was the subject of the presentation by Diilwe Syamuntu titled ‘Information sharing for adaptive management of ecological infrastructure – a case study of invasive species control in the Kafue Flats in Zambia’. The wetland (Kafue Flats) is threatened by Mimosa pigra sp. The task of assimilating and managing the information needed to promote best management practices of ecological infrastructure has become increasingly difficult. This is because of the increasing complexity of managing ecological infrastructures due to diverse actors and emerging issues such as the spreading of invasive tree species. As the actors in a social-ecological system become more diverse, information sharing becomes important for the adaptive management of ecological infrastructure, because intervention measures designed to curb the spread of invasive species need to be coordinated and monitored closely during implementation to confirm their effectiveness, and to help refine future actions. Jerit Dube’s presentation was on the ‘role of green infrastructure in flood management’. This was based on her fieldwork in the Lusaka informal settlement in Durban, South Africa. She explored institutional and response diversity in flood management through green infrastructure practices in informal settlements. Her argument was based on the proposition that in order to build adaptive capacity to flood risk, there is a need to implement diversified practical solutions, and involve diverse actors or stakeholders (governmental organisations or public services, NGOs, community, private services at various levels). There is no single appropriate philosophical framework, or unique optimal strategy or policy that can solve the issue of floods, but there are many, hence the need for diverse approaches. The use of green infrastructure (GI) comes with its own challenges. In developing countries in general, and South Africa in particular, one of the challenges that GI as a concept faces is that of prioritisation and legitimacy. This was outlined in Busani Masiri’s presentation on ‘Chasing legitimacy – exploring green infrastructure functionality prioritisation’. He argued that in order for GI to be acceptable as a concept that contributes towards urban resilience there is a need for it to find legitimacy in the eyes of the primary beneficiaries of the resultant ecosystem services. He said that GI has been framed from an anthropocentricism point of view and that its legitimacy is constructed from a utilitarian or hedonic perspective, depending on the motivations of the intended beneficiaries of the infrastructure or the spatial planning authorities. As such, there’s a need for collaborative efforts between the spatial planners, policy makers, residents and environmental practitioners in defining the ecosystem services that the chosen GI is to provide in a given locality. The involvement of the residents affords policy makers and spatial planners context-specific information that helps build resilient social-ecological systems whilst also providing nature-based infrastructure as required by specific communities. The insights of this event are perhaps best captured in the individual narratives and thoughts of the three students from Monash South Africa who were in attendance. Each gave a presentation about their research, which is funded by the International Water Security Network. In the Bemba language, Insaka means ‘a place to come together’. In keeping up with the spirit of Insaka and the transdisciplinary nature of the Man and Biosphere Programme, participants at the symposium were drawn from very different disciplines, from animal biology to town planning. As well as participants from the five universities signatory to the Insaka Memorandum of Understanding and invited guests, the symposium also included delegates from the sponsoring organisations – SANParks, USAID and WWF. Thus the event was rich in presentations, from ‘citizen science and communication to protected areas as outdoor classrooms and living laboratories’. By bringing together participants from different disciplines, the symposium provided a platform to share and learn from some of the interesting research into green and ecological infrastructure. For me, Insaka is a community of practice with passion, commitment, and professional competencies. The platform has a potential to provide research-informed leadership and innovation that influences the management of complex social-ecological systems. As such, the symposium was a great way to share ideas, best practices, and the pitfalls to avoid for the successful implementation of green and ecological infrastructure policies and projects as well as the sustainable management of natural infrastructure. The learning opportunities extended beyond the best practices. Through interactions with fellow participants I also got academic input into my current research on ‘exploring diversity in flood management through green infrastructure practices’. I enjoyed attending the 2018 Insaka Research Symposium. I was most impressed by the extent to which several different disciplines showcased their concern for ecological infrastructures. The interdisciplinary nature of the conference was also a great opportunity to for me to network and talk with others outside of my research area. Most importantly, it was a challenging, thought-provoking opportunity to see how I could best improve myself, in terms of developing my research skills and publications. Overall, I am incredibly grateful that I was able to attend this conference and that I was able to create lasting relationships with others across various academic disciplines.